2000 MR. OLYMPIA. "Mr. Perfect" Ronnie Coleman wins every round in this decisive victory, closely followed by Kevin Levrone in a near-unanimous silver medal finish over Flex Wheeler. Fantastic DVD coverage of the world's greatest physiques! This 90-minute DVD includes both "muscularity round" prejudging highlights and complete awards ceremonies -- order yours today! Take an early look at future Mr. Olympia champions in Jay Cutler and Dexter Jackson. For all fans of RONNIE COLEMAN, check out the GMV training DVD on him which is RONNIE COLEMAN ON THE ROAD, click here for GMV-620DVD. 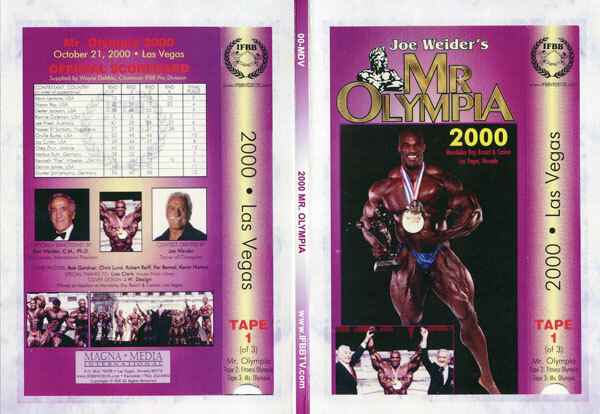 This is an authorized and licensed 2000 Mr. Olympia DVD copy made directly from the broadcast-quality master tape.